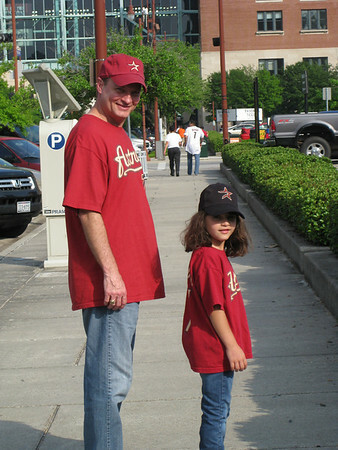 We made our way downtown Friday at the crack of early evening to take in our first (and very likely my last) Astros game of the season. My two people were beyond excited. 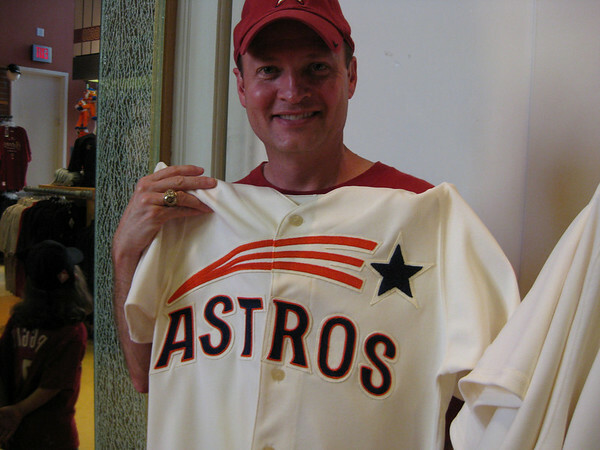 The bigger one was eager to see the game and get his free Astros blanket (he goes a bit nuts for promotions) and the little one was eager to eat copious amounts of overpriced junk food. I was mourning my decision to leave my book behind (evenings like this made me wish I had a Kindle so I could read a little more discreetly and hopefully not get popcorn thrown at me for poor sportsmanship). Since we had to get that ridiculous free blanket (three, actually) Scott insisted we get there as close to when those ballpark doors opened. We've had a few close calls over the years when someone, not naming any names but she tends to drag her flip flops when it comes to baseball and wishes she could bring her books along, caused her husband to miss out on free junk merchandise. He still may be nursing a grudge or two. After receiving our blankets (and hearing someone let out a sigh of relief), we had plenty of time to kill before the game started to browse the gift shop and get something to eat. This is probably the closest Scott will ever get to this retro jersey since it's priced at the rock bottom clearance special of $250. Ahem. 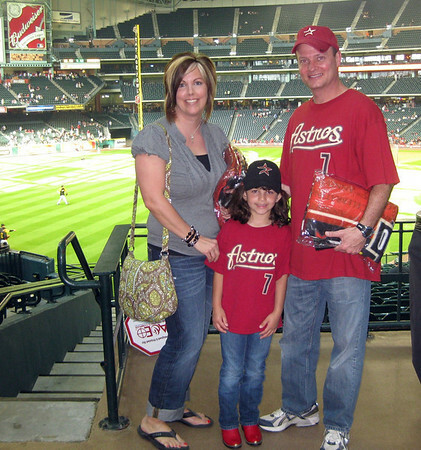 We paused for a family photo near left field. 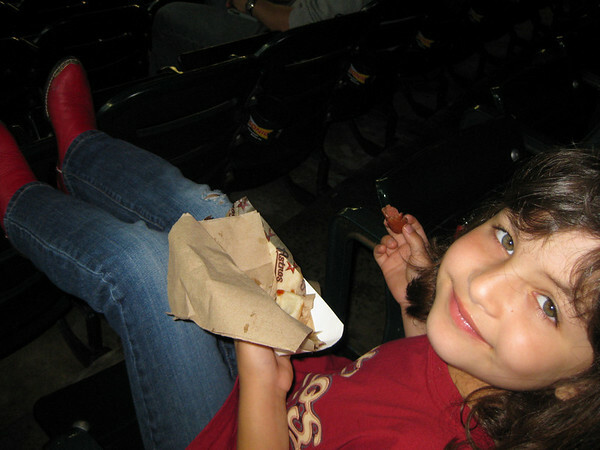 Annelise settled in with her hot dog and was already eyeing the cotton candy and snow cones being hawked around us. We managed to avoid those, but did get popcorn later. 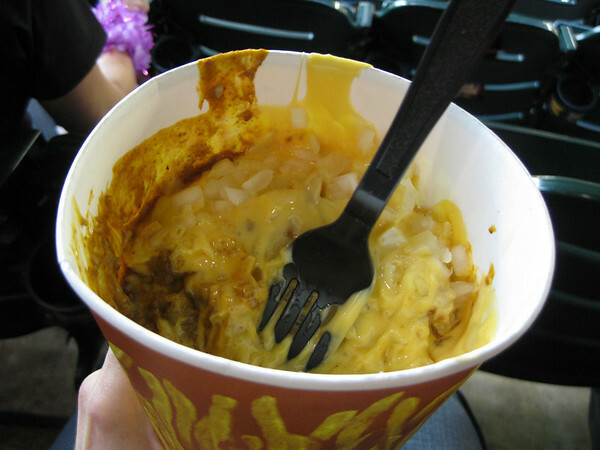 Well, about 15 minutes after the hotdog, and the game had barely started at that point. Scott decided on pizza and I went for the culinary delight otherwise known as chili cheese fries. Our seats were in the middle of the row, where the view was good, but I hate feeling trapped and having to crawl over people (and their beer) when I need to get out. 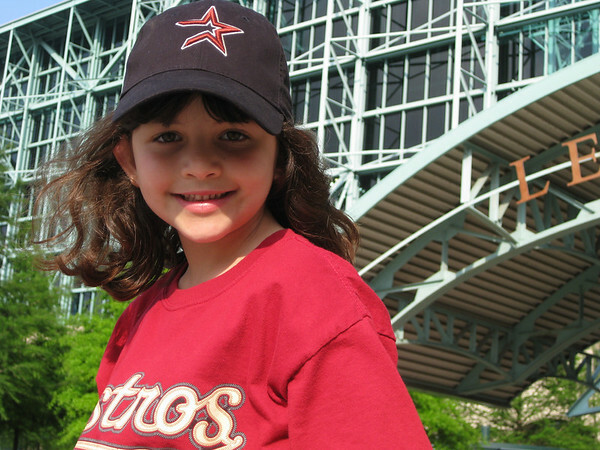 The good news is, the Astros ended up winning (this is rare so far this season) and we left a little early. The bad news is that Annelise left her baseball cap on the toilet paper thingie and while she was washing her hands, someone snagged it. She was crushed, and then angry, and then tearful, that someone did that (and upset she had left it in the first place). The other bad news is that by leaving in the 8th inning we missed the fireworks show, which is always a hit, but we forgot. Oh well, at least we have our blankies. too bad about A's hat!! that is a tough lesson! 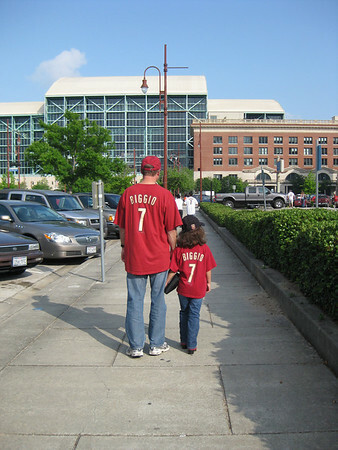 love the Biggio shirts! The hat situation is awful, I'm so sorry someone took it. You're a good sport for going along, it seems. I LOVE going to baseball games. In fact, we're going to our first Rangers game of the season tomorrow. I'm hoping many more will follow though. So fun! Nicole: I used to enjoy the games a lot more when I knew/followed/liked the players. There have been so many trades and recent retirements that I only know a couple of the players. My favorites are gone! Sniff! Sniff! Outings like this always end up feeling like more work than they're worth to me.